Compact FM analyzer designed for fixed installation as well as for daily work in the field. Durable laser machined aluminium case with internal steel frame, front panel is covered with acrylic glass. USB and RS-232 connectivity, alarm outputs, headphones output. Ideal for embedding into an enclosure or customer's product to add FM modulation measurement and RDS decoding functions. Many assembly options are available for I/O connectors, LCD, buttons, spacers etc. SVG format support added to the FM Scope. New FM Scope and P275 firmware versions released. 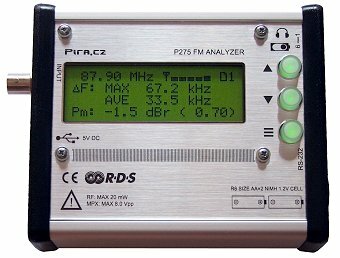 New FM Analyzer model introduced - the P275 FM Analyzer.